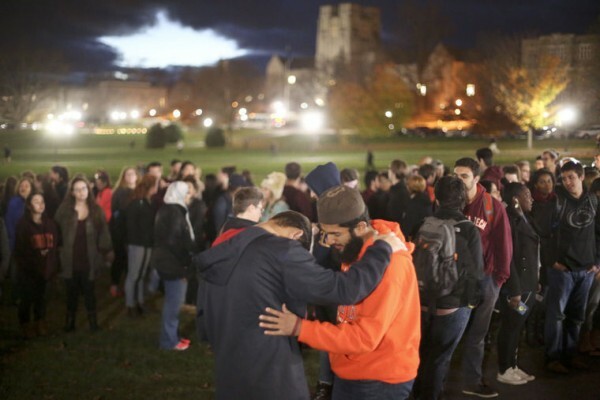 Death Threats At Virginia Tech: How Should Muslims Respond? The Washington Post reported that Virginia Tech found graffiti inside a bathroom stall in Price Hall that stated, “I will be here 11/11/2015 to kill all muslims (sic)”. According to the institute’s publication The Collegiate Times, the Virginia Tech Police Department is investigating the death threat and are collecting information via phone and online. President of the Muslim Student Association at Virginia Tech Obaid Rehman blamed rising Islamophobia in the US as a contributor to the potential for violence against Muslims. How should the larger community of Muslims respond to this? In the larger scheme of things, how should we deal with the increasing number of hate crimes and death threats as a result of normalized Islamophobia? Since 9/11 and every time a horrific event happens where the perpetrators are identified as “Muslim” I feel as though I have to apologize to the entire world. I feel that I’m wearing my guilt or Hijab as a statement that holds me responsible for all the murders happening in the name of Islam. Well, associate professor of religious studies at the College of the Holy Cross in Worcester, MA Caner K. Dagli says that Muslims must stop feeling a necessity to disassociate themselves from and denounce crimes that “Muslims” commit elsewhere, because in doing so we are maintain social hierarchy. “When an attack takes place in the West it is the Muslim community that suffers the backlash from the societies in which they live in…This is really about political statements and maintain a certain social hierarchy. Demanding that innocent Muslims always make new statements about crimes they could not have stopped, from which they do not benefit, and have always condemned anyway, is an act by the powerful assigning collective guilt against the powerless,” writes Dagli in article published by CNN. Whenever you witness any kind of crime or hate speech against Muslims and Islam describe it using the word Islamophobia. The more we do this, the more the term will be accepted and become a part of common discourse. In the Islamophobia Studies Journal, S. Sayyid says in “A Measure of Islamophobia” that we need to name it so that people can address it. “Islamophobia is a concept that emerges precisely to do the work that categories like racism were not doing. It names something that needs to be named. Its continual circulation in public debate testifies to ways in which it hints at something that needs to be addressed,” says Sayyid. Stating the obvious? Not really! Some Muslims feel somehow “responsible” for 9/11 and the horrific acts of ISIS. They might be discouraged from reporting anything threating to authorities no matter how small or big it is. The reason being strong Islamophobic messages associating Muslims with terrorism. In an article titled “Subtle and Overt Forms of Islamophobia: Microaggressions toward Muslim Americans”, the authors argue that Muslims being subjected to negative media ideas could actually impact their ability to function daily. “Muslims often endure negative media messages in both the news and on fictional television shows. Being the victim of such covert discrimination on a consistent basis can have an additive affect on one’s mental health and ability to function daily,” says the article. Become an advocate. Connect with organizations to address the situation. Bring up the topic of Islamophobia at your meetings, school discussions or gatherings. Organizations such as Council on American-Islamic Relations, Muslim Advocates and Islamic Circles of North America, advocate for and assist individuals facing racism and Islamophobia. This article is a load of crap. Islamaphobia? Really? I can’t imagine why people would be afraid of the cult of murderers and terrorists that the religion of Islam is. Get the f** out of our universities and countries! Who invited you here? You screw up your own countries and you flood all the other countries of the world like insects! That’s what you are, insects! GO BACK TO YOUR COUNTRIES, YOU INSECTS! universities are a muslim invention? Hahahah these idiotic,ignorant , racist anti Islam people actually make me laugh I have never had a good laugh in agesssss their comments are usually aimed to be condescending but it turns out to be plain stupidity really. Hmmm if your going to kills us all i won’t think you will survive (laughs) ??????????? ?